In this five page Read and Write pack, students will read the one page story and color the pictures. Then there are two pages with five sentences on each page about the story. Each sentence has a missing word. At the end of each sentence, there are two words for students to choose the correct missing word. Students will circle the word that correctly completes the sentence matching the story on the first page, and then write the correct word in the blank. The next page is a cut and paste activity. Five sentences from the story are shown with a missing word. The five missing words are at the bottom of the page for students to cut and glue the correct word to complete the sentence. For both of the above activities, have students go back and find the sentence in the story and underline or highlight the sentence to show where they found the answer in the story (find text evidence – prove it). This will help them complete the activities with the correct answer by going back to the text which is what close reading is all about (digging deeper). The last page is a writing activity that asks two questions: 1. What kinds of food do you eat on a picnic? 2. What do you like on your hamburger? This writing activity gives students the opportunity to make text to self connections. 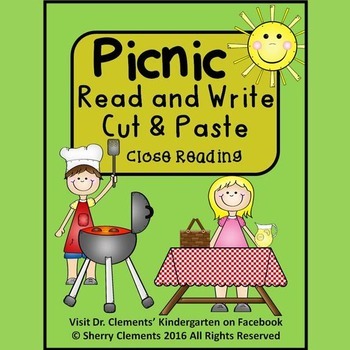 ***Picnic READ AND WRITE IS #35 OF 35 READ AND WRITES IN MY STORE; HOWEVER, IT IS THE 8th READ AND WRITE TO HAVE FIVE PAGES. 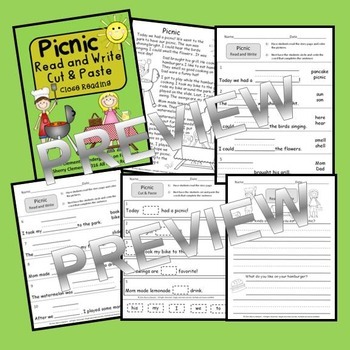 THIS READ AND WRITE, LEMONADE, BUGS, COMMUNITY HELPERS, SNOW DAY, FISHING, BOWLING, and The RACE READ AND WRITES ALSO INCLUDE A CUT AND PASTE PAGE TO CORRECTLY COMPLETE THE SENTENCE AND AN ADDITIONAL WRITING PAGE NOT INCLUDED IN THE PREVIOUSLY CREATED READ AND WRITES. PLEASE LOOK AT THE PREVIEWS AND READ THE DESCRIPTIONS IN THE OTHER READ AND WRITES BEFORE PURCHASING TO KNOW WHAT IS INCLUDED IN EACH ONE. THANK YOU! This product is NOW AVAILABLE in a Read and Write Bundle (Set 5) offering a SAVINGS of 12%.